Very private lake setting with tall pines and beautiful sunsets. Come and enjoy this classic lake cottage! 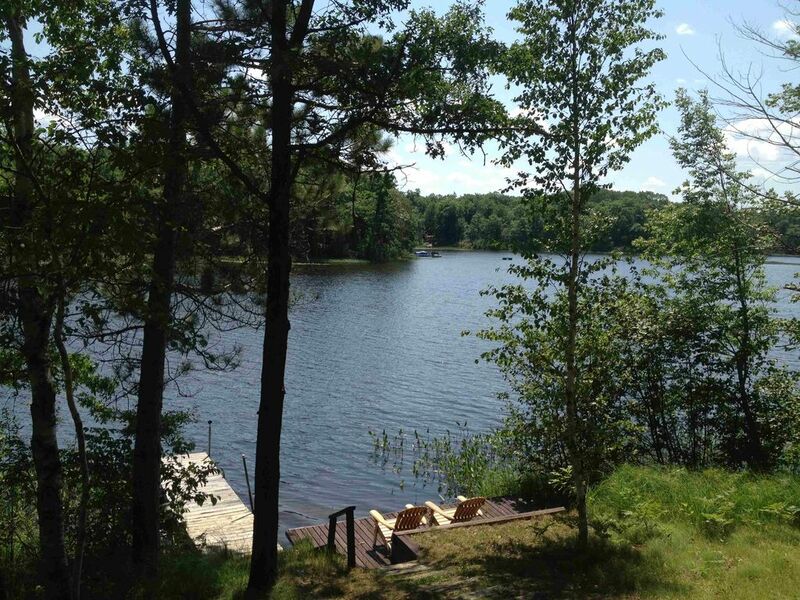 Built on a very private setting this 2 bedroom home is the perfect quiet lake getaway. The cabin sleeps (4) in beds but plenty of floor space for cots, air mattresses which you will need bring along with you along with the linens. Te home setting is on a large double lot with tall mature oaks and pines. A gentle slope to the lake and a beautiful southern exposure add to the charm. Cabin comes with a canoe and (2) kayaks to enjoy quiet lake adventures. Reed Lake is a private lake with no public landing...there is very little boat traffic. However, there is a place to dock your boat across from the cabin if you wanted to bring your own boat or pontoon. Fishing for bass, panfish and northern pike are all possibilities. We include a nice lake side fire pit with ample firewood for your stay. Two lake side adirondak chairs make a nice destination for your morning coffee or evening glass of wine. Cabin interior is classic rustic cottage. Two fireplaces add to the ambiance...one gas and one wood. Kitchen was redone in 2012 with all new appliances including a dishwasher. Wood floors, cedar walls and lots of glass make this home very cozy. A large deck and very private yard is great for kids and pets. Not all lake homes are created equal. If you are looking for privacy in your northwoods escape it is not easy to come by. Most lake homes in the Hayward area on lots that afford little privacy...not this one!! We live in Hayward and bought this fabulous cabin because it was so private. We wanted to have a place to go and relax...a place for high quality family time. This cabin on Reed Lake continues to be one of our favorite places to get away to. Privacy was the number one reason we purchased this property. The sunny southern exposure, tall mature trees and lack or boat and jet ski traffic sealed the deal for us. Private, great swimming lake, southern exposure, quiet, peaceful surroundings. We provide (4) large bath towels - please bring what other items you feel you will need such as wash cloths, beach towels or more bath towels, etc. Nice dining area with wood fireplace. Not connected to cable - for movie watching only. Both VHS and DVD player provided - please bring your own tapes or DVD's. A few VHS are on site. Connected to tv in large bedroom - please bring your own DVD's to watch. (2) kayaks, (1) canoe and some life preservers on site. The cabin was awesome for our 4 night winter stay over birkie weekend. Loved the very private setting. Great instructions on the use of the place. Rhonda and Fred were extremely helpful! Definitely will rent this cabin again. Cabin was clean and cozy and had everything we needed. Great location with easy access to area restaurants and attractions while also feeling private and homey. Lake location and views were awesome. We enjoyed ice fishing and cross country skiing on the lake during our winter stay. Would definitely stay at this cabin again and the Hayward area is hard to beat if you are looking for a nice getaway. We stayed here over NYE and it was great! So much so we stayed an extra night. Great spot on the lake. You feel like you're away but only a short drive into town if you need anything. There is a lot to do in Hayward (ATV, snowmobiling, trip up to bayfield). Would definitely go back. Bring your own hand towels and paper towels. FYI the beds are ok.
We loved the cabin and the perfect privacy it offered. It is beautiful and even though it rained a lot, we did not mind hanging around relaxing. The gas fireplace kept it so cozy! It was wonderful to look out the windows into all the trees and seeing black Squirrels, Woodpeckers and even a Bald Eagle. If we get back into the area we would definitely try to stay there again. Perfect get away. Very clean and modern. Private setting, short trip to town. Great views from the deck. Will definitely rent this property again! Our stay in Hayward was truly wonderful. The cabin was incredibly spacious, updated, and very warm and comfortable. The availability of kayaks and a canoe was really a treat and let us get out to experience the lake and the outdoors. I can't wait to come back to this cabin next summer! Canoeing, Scheer Lumberjack Shows (Memorial Day to Labor Day), mini-golf, go carts, shopping, many nearby restaurants, golfing, incredibly cross country skiing (winter months) on the world famous Birkie Trail.